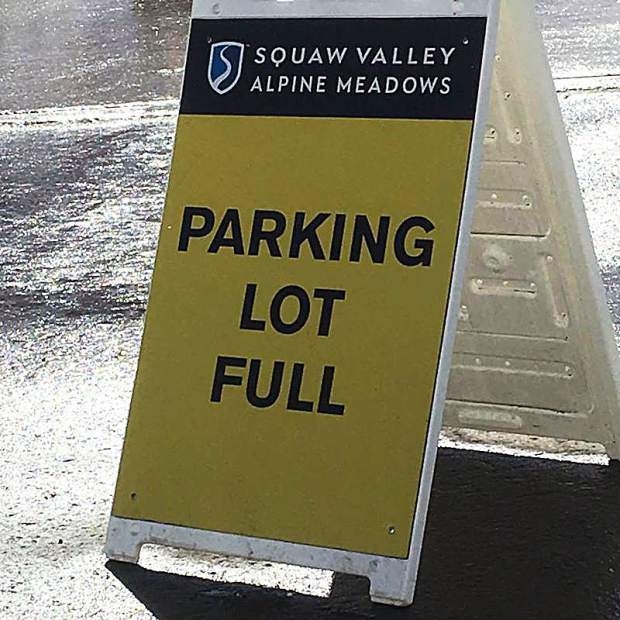 The all-too-familiar "Parking Lot Full" sign has often greeted Squaw Valley skiers this season. An earlier version of this story incorrectly stated that the Squaw Valley Fire Department parking lot would have spots available for cars of World Cup attendees. This statement is not correct; according to the department, it will not have any parking spots available this weekend. The regrets the error. Visit www.squawalpine.com/worldcup for a complete list of 2017 World Cup weekend events. Also, it won't be all about skiing this weekend at Squaw — from fireworks to a parade to big-name music performances, there will be something for everyone to enjoy. Click here to read what else is planned for the big weekend. OLYMPIC VALLEY, Calif. — As Squaw Valley is preparing to host the Audi FIS World Cup this weekend, one of the main concerns among locals — which has been an increasing issue this winter overall — is where guests can park. The Tahoe region has been hit with a series of major storms in 2017 that has left the resort with a season-long snow accumulation of 383 inches at an elevation of 6,200 feet, and a cumulative snow total of 623 inches as of Tuesday at 8,000 feet. 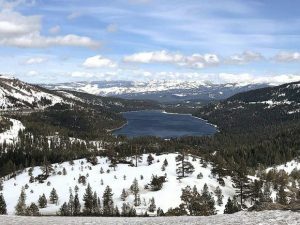 Considering all of that snow, only 75 percent of the resort’s parking capacity is available, as the other 25 percent is only used for snow storage, said Liesl Kenney, Squaw Valley Alpine Meadows Public Relations Director. However, a few Squaw locals say that they are so used to busy weekends ski weekends this year — due to all the snow, as well as pent-up skier demand — that the World Cup isn’t going to faze them. • Take a free bus from Truckee or Tahoe City: Leave your car at Tahoe City Transit Center/64 Acres or at the Truckee Tahoe Airport and hop aboard 48-passenger Amador Stage Lines buses that will have space to stash your ski gear below. Four buses depart from the Truckee Tahoe Airport every 15 minutes from 6 a.m. to 7 a.m., and every half an hour from 7 a.m. to 9:30 p.m. on March 10-11. From Tahoe City, two buses will depart every 30 minutes between 6 a.m. to 7 a.m., and then every hour from 7 a.m. to 9:30 p.m. March 10-11. • Take three or more of your friends and get free up-close parking with the “POW Carpool.” Protect Our Winters (POW) and Squaw Alpine have teamed up to reward vehicles with at least four passengers with free parking within resort grounds available on a first-come, first-serve basis from March 9-12. • For those staying at the Resort at Squaw Creek, a shuttle will run every 15 minutes from 7:30 a.m. to 11 p.m. Since the Squaw Creek chairlift will be closed to the public to accommodate the event, additional round-trip transportation will be available to caravan people from the Squaw Creek chairlift load to the Far East Express area from 7:30 a.m. to 5:30 p.m. from March 8-11. • Don’t forget about the regular Squaw Alpine Express: As usual, shuttles will go between the two resorts every half an hour or so from 8:30 a.m. to 4:30 p.m. Skiers are urged to arrive 30 minutes prior to final departure. • Check out the secret parking spots at Hidden Valley and Deer Park. Around Alpine Meadows, the parking lot across from River Ranch where the Truckee River Raft Company parks its vehicles will be available to World Cup guests, according to Squaw Valley. 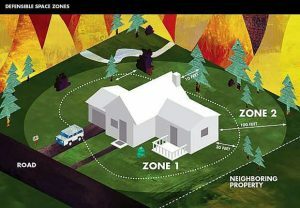 Spaces are also available at Deer Park, located at the base of Alpine Meadows Road. Shuttle services from Deer Park will be running 6 a.m. to 9:30 p.m. March 10-11. She added that there will be traffic controllers at the Squaw Valley entrance and electronic signboards at The Mousehole on Highway 89 near Truckee, as well as in Tahoe City displaying updated parking information. “If you’re here by 7 a.m., then you’re totally fine to park, and many of the Village’s restaurants will be open by then, but there have been some days when I’ve gone to work at 7:30 a.m. and have run into a bit of traffic,” says Kenney. For a renowned event like the World Cup, she suggests that the earlier you get there the better. For Olympic Valley residents and their guests, getting around the area may also be an issue, but luckily there’s Chariot, a free, app-based shuttle service that will be available March 9-11 from 8 a.m. to 5 p.m.
Much like Uber, Squaw Valley locals can download the Chariot app, schedule their pickup time and monitor routes of the company’s 14-passenger shuttle buses.